Without it, activists will have to find new ways to bring about change in 2017. On a glorious afternoon in August 1963, after the massive March on Washington for Jobs and Freedom wrapped up on the national mall, President John F. Kennedy, prodded by Attorney General Robert Kennedy, welcomed John Lewis, Martin Luther King Jr., Bayard Rustin, and other march organizers to the White House for a discussion of proposed civil rights legislation. Fifty-four years later, on an afternoon in January 2017, when the even more massive Women’s March on Washington wrapped up, President Donald Trump responded with a sarcastic tweet. Just the day before, Trump’s team had removed the “civil rights” page from the issues section of the WhiteHouse.gov website and replaced it with a new entry entitled “Standing Up For Our Law Enforcement Community.” The page is still missing. Today, with the three branches of government controlled by men intolerant of dissent and hounded by their own dark vision of pluralism, few human rights advocates of any stripe can reasonably expect a hearing in Washington. Our long-running, ongoing, unfinished American civil rights struggle that so often focused on pressing the federal government toward justice, is suddenly in uncharted territory. The legacy of Reverend Martin Luther King has slammed up against the legacy of Alabama Governor George Wallace, whose snarling campaign for president in 1968 has come home to roost in the presidency of Donald Trump. Where civil rights leaders, warriors, and foot soldiers found support in high places they will now find a void. Amid discussion of renewed civil rights activism, you may well ask whether we’ll need to fight those fights all over again. Will black people once more have to claim their humanity? For perspective on this moment, let’s consider why the strategies of the southern liberation struggle worked as well as they did back in the day. The classic civil rights movement (1954-1965) was sparked, organized, and driven by local people and leaders (maids, teachers, farmers, cooks, janitors, students, ministers) in a hundred southern towns who, with ferocious courage, stood up and said “No more!” Their victories — some temporary, some lasting — regularly depended on their ability as citizens to reach beyond local and state segregationists to faraway presidents, congressional representatives, federal circuit court judges, and Supreme Court justices in Washington, appealing to them to respond with regulations, executive orders, laws, and even armed force. Dogged organizing by the Student Nonviolent Coordinating Committee (SNCC), the Congress Of Racial Equality (CORE), and the Southern Christian Leadership Conference (SCLC), together with the NAACP’s decades-long legal campaigns, Martin Luther King’s rhetorical genius, and the massed moral crusade of black southerners first shamed and finally forced the latent hand of federal power. Alert to this leapfrog tactic, Malcolm X, W.E.B. Du Bois, and others went a step further and tried unsuccessfully to appeal to the United Nations, as more recently have the parents of Trayvon Martin, Michael Brown, and Jordan Davis. With its unanimous 1954 Brown v. Board of Education school desegregation decision, the Supreme Court signaled to African Americans in the former Confederacy that they had a friend in Washington. In Brown, by the sheer weight of evidence, moral suasion, and reason, a handful of African American parents, children, and their lawyers had compelled nine aging white justices (including former Ku Klux Klansman Hugo Black) to agree that all citizens deserve equal education. In a similar manner over the next decade, one powerful judicial, congressional, and presidential ally after another would step up, willfully or grudgingly, to affirm simple justice, rights long promised but also long deferred. Their embrace of civil rights was sometimes a matter of conscience, sometimes a savvy calculation of their constituents’ electoral mood. Those actions would, in the end, help open doors and extend legal rights to ethnic minorities, women, immigrants, workers, and most recently gay, lesbian, and transgendered citizens. Major legislation — the Civil Rights Act of 1957 which established the Justice Department’s civil rights division, the 1964 Act which outlawed discrimination on the basis of race, color, religion, gender, or national origin, the Voting Rights Act of 1965, and the Fair Housing Act of 1968 — and hundreds of decisions handed down by federal district courts, circuit courts, and the Supreme Court all slowly expanded protections to African Americans and set precedents for all Americans. Unlike blacks within white-ruled South Africa who, at the time, were not citizens of their own nation and had little hope of federal protection, blacks across the deep South could succeed because they were citizens not only of their own states, but of the United States. Few in the 1960s believed that marching, demonstrating, sitting in, agitating, witnessing, disrupting, or singing could ever change the minds, much less the policies, of a half-dozen southern governors, a hundred county sheriffs, or millions of white segregationists. The Montgomery bus boycott was successful in driving the bus company to the edge of bankruptcy, but legal bus segregation remained intact until the Supreme Court stepped in. Persuasion, appeals to reason, and simple justice certainly recruited northern liberals and some white southern moderates to the cause, but southern blacks could have preached the Sermon on the Mount or the U.S. Constitution daily to White Citizens’ Councils to no effect. In the end, the decisive language that spoke to white oppression was power, and the power that proved decisive often lay in Washington. While economic boycotts might sometimes force compromise on local businesses and segregationist officials, generally the trick was to vault over them to, if necessary, the president himself. In the documentary Eyes On The Prize, Burke Marshall, head of the Justice Department’s Civil Rights Division under President Kennedy explained, that, when push came to shove, no deep southern city or state could resist escalating federal force. “I suppose,” he commented, “the president could have sent the United States Navy up the Mississippi River” — which was exactly what Abraham Lincoln had done a century earlier. At the extreme, Republican and Democratic presidents deployed deputies, federal marshals, national guardsmen, and in the end even Army troops to enforce federal anti-discrimination laws and protect dissenters’ rights under the First Amendment when state and local officials refused to do so. If the attack dogs, bombings, and mass arrests of children got bad enough in Birmingham, and if it all appeared on television nationwide, local black organizers came to understand that they could usually depend on predictable moral outrage in the White House, a Congress worried about reelection, or the Supreme Court for a remedy. In 1957, faced with news bulletins of white rioters and Alabama national guardsmen blocking nine black students from entering Central High School in Little Rock, Arkansas, Republican President Dwight Eisenhower reluctantly sent in elements of the Army’s 101st Airborne Division, declaring on prime-time television, “Mob rule cannot be allowed to override the decisions of the courts.” Five years later, President Kennedy, a convert to the civil rights cause, would similarly dispatch his Assistant Attorney General Nicholas Katzenbach and 200 federal marshals backed by the U.S. Army to ensure that James Meredith could enter the besieged campus of the University of Mississippi. Movement leaders patiently calculated a strategy for success that often depended on the press, in particular the new medium of television news, to haul Jim Crow’s physical, social, and civic brutality out of the backwoods and into the nation’s living rooms. They understood that news crews would flock not only to record Martin Luther King’s oratory but also the flamboyant antics of a few southern sheriffs and the grand theater of mass non-violent resistance. Confronted with televised attacks on peaceful demonstrators, a majority of congressmen, including dozens of Republicans, might acknowledge the searing contradictions of state racism for what they were. Whether good will, cynicism, or electoral savvy drove politicians’ actions, the strategy worked. The national media provided a direct prod that regularly stiffened spines in Washington, but such public disapproval by hectoring northern journalists also brought white southerners together in solidarity against the media elites (a phenomenon that should have a certain resonance in present-day America). White crowds knew that network television coverage spelled trouble for legal segregation and often went for the cameras. Those mobs understood the postmodern power of images as well as any postmodernist. When the first Freedom Riders’ bus rolled into Birmingham’s bus station in 1961, dozens of Klansmen attacked the waiting newsmen first before they went after the riders. There would be no news clips of that event on TV that evening. On the horrific night when James Meredith tried to enter the University of Mississippi, the mob, flying Confederate battle flags, attacked the media, smashing cameras, beating cameramen, and killing a reporter from Agence France-Presse execution-style, before shooting 35 federal marshals. Second only to the courage of African Americans was the courage of those highly visible TV crews. They would stay miraculously calm and focused, navigating the mayhem between marchers, mobs, and lawmen. Though they were constrained by journalistic standards from partisanship in reporting, many of those crews could not escape their growing sympathy for the movement, and found themselves ready to join in the reformation of America with their pictures and words. They were televising a particularly disgusting pageant: officers, under the sanction of state and local laws, bludgeoning, fire hosing, arresting, punching, cattle prodding, whipping, tear-gassing, and even shooting defenseless, unresisting black people who had declared their commitment to nonviolence. It happened month after month throughout the 1960s. Movement leaders chose their sheriffs carefully, judging their battlegrounds in part by the quality of available villains. They favored bad actors like Chief Bull Connor, the proud bigot of Birmingham, who unleashed fire hoses on teenaged marchers with operatic fury, and Selma’s increasingly unhinged arch-segregationist sheriff, Jim Clark. The 1965 battle royal in Selma, Alabama, marked a milestone in the expansion of democracy for the town’s African Americans, which had begun with the emancipation of its slaves during the Civil War. Selma first came under siege by Union regulars in April 1865. The Confederate defenders, an ill-trained muster of white militiamen, kids, and old men, were no match for the northern troops who ran them out of their hometown, then spent the night burning and looting. Selma’s slaves were officially freed, but after a fleeting window of hope, Reconstruction and Jim Crow would strip them and their immediate descendants of nearly all their constitutional rights. By 1965, almost a century after the passage of the Fifteenth Amendment, which unambiguously declares, “The right of citizens of the United States to vote shall not be denied or abridged… on account of race, color, or previous condition of servitude,” the percentage of registered black voters in Alabama was actually falling. Local white voter registration clerks in Selma had allowed only 2% of the city’s 14,000 black citizens to register, compared to 90% of Selma’s whites. A carefully targeted registration campaign by local organizers and SNCC (later joined by the SCLC) aimed to shine a national spotlight on local oppression and so spur congressional action that would open up voting for black citizens throughout Alabama and eventually across the entire deep South. Strategically deploying Martin Luther King (just back from accepting the Nobel Prize in Norway), the movement in Selma set out to provoke Sheriff Clark and his famously brutal posse. As SNCC’s Jim Forman said, “We were laying a trap.” The aim was to heighten a moral battle of Shakespearian proportions that television would then beam directly to President Lyndon Johnson. At one point, the city would have 20 times more blacks in jail than on its voting rolls. Confrontations simmered throughout the winter of 1964-1965, punctuated by sudden explosions of violence. Reason, brotherly love, massed demonstrations, and inflamed national opinion made no dent in Jim Clark’s enduring pathology. Like a man possessed, he simply couldn’t stop himself from behaving badly in front of the cameras. He delivered the gaudy media goods, week after week, exactly as movement strategists had hoped he would, exactly as Selma’s few moderate whites feared. The scenes of violence flashed around the country on TV every night, and appeared in the pages of the New York Times and Washington Post. By 1965, President Johnson, a Texas Democrat, was ready to take risks on civil rights. He had already directed his White House staff to secretly prepare sweeping voting rights legislation and even a constitutional amendment. Now, the only thing needed was a trigger, and that finally came on March 7th, “Bloody Sunday,” when John Lewis, Hosea Williams, Bob Mants, and Albert Turner, leading hundreds of locals, crested the Pettus Bridge on their way to deliver a voting rights petition to Governor George Wallace at the state capitol. All hell broke loose. Whites cheered from the roadside as Alabama state troopers and Clark’s mounted posse clubbed, bullwhipped, and tear-gassed their way through 600 unarmed black men, women, and children. A trooper fractured John Lewis’s skull with his billy club. Here was the massacre of the innocents for all Americans to see: southern lawmen in their pig-faced gas masks going berserk against African Americans who stood and took it. That televised attack, a crystalline icon of the era, worthy of Dante, had by evening rallied nearly all of Washington to the marchers’ cause. It would one day become a sturdy staple of history texts and documentaries. That night, local whites murdered a northern Unitarian minister. President Johnson sent 2,000 federal troops to Selma as Lincoln had done 100 years before, this time to protect peaceful citizens of Alabama from Alabama state troopers. He went on national television to proclaim, “Their cause must be our cause, and together we shall overcome!” and then dispatched a sweeping voting rights bill to a willing Congress. After it passed the House by a vote of 328 to 74 and the Senate by 79 to 18, Johnson signed the act into law with John Lewis and Dr. King at his side. By their determined organizing, marching, demonstrating, and most of all by their relentless courage, local black people had successfully appealed to Washington, finally brought legalized American apartheid to its knees. Black voting in Alabama jumped seven-fold in the next three years. Without the media slamming blunt facts in the face of sympathetic (or politically savvy) power brokers in Washington, “Bloody Sunday” might have left in its wake little more than a few hundred broken and bleeding marchers and the Jim Crow voting system still intact. Without the TV coverage and a president and Congress capable of being won over, it might have been the civil rights equivalent of a tree falling silently in the forest, not the engine of sweeping change that it was. Back in 1965, the charm of Selma was lost on most of us who ventured there. I’ve returned a few times since, first in 1985 to shoot scenes for Eyes on the Prize, including an interview with an unrepentant Jim Clark. The town was, by then, smaller, blacker, and poorer. In 2015, I returned again with producer Orlando Bagwell to work on a film for the Southern Poverty Law Center. From a distance, nestled on a bluff above the Alabama River, Selma looked to me like a picturesque little town in southern France. The air below the Edmund Pettus Bridge, now a national historic landmark, was alive with swallows. Selma’s lovely historic district seemed nicely parked somewhere between 1850 and 1950, but much of the rest of the once-prosperous town had, like so much of small town America, been hollowed out by recession and a changing economy. We could find only one restaurant open for supper downtown. Many of its beautiful nineteenth-century buildings were boarded up. Gaping bullet holes pockmarked the granite tombstone of Jimmie Lee Jackson, whose murder by a state trooper had sparked the original Bloody Sunday march. The Civil War Battle of Selma is still reenacted annually on a field outside town, with the Confederates defeated again, each year. 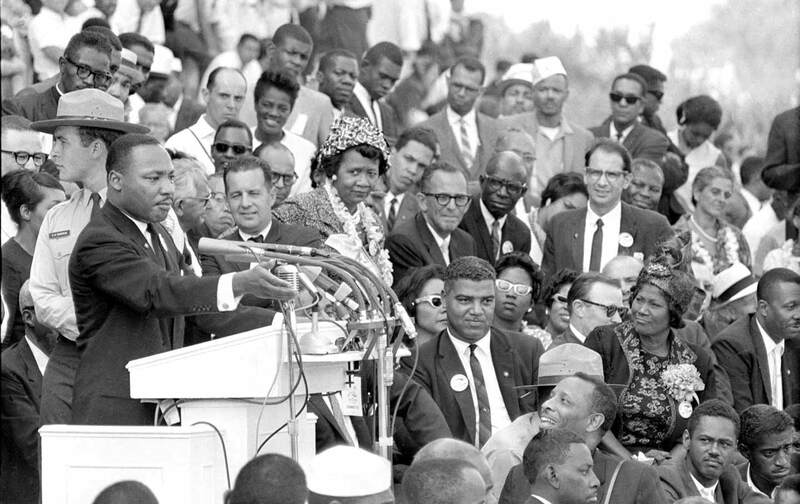 The Voting Rights Act forged in Selma had been a triumph of the classic civil rights movement, the hinge between everything that came before and so much that would come after. But we had little reason to suspect or notice when, shortly after the act’s passage in 1965, conservative organizers began a methodical 40-year campaign to gut it. As black voter rolls in rural Alabama swelled, the state’s young federal prosecutor, Jeff Sessions, brought charges of voter fraud against civil rights organizer Albert Turner, a leader of the Bloody Sunday march. His case collapsed in court, but resistance continued, culminating in a 2013 Supreme Court decision that struck down one of that act’s key provisions (federal approval of state changes in their voting laws). Ever since, a Republican campaign to put new voting restrictions in place has only gained momentum. In 2015, however, few had noticed the most profound changes of all, even though they were stirring just below the surface of things: sweeping working class frustration; previously dormant strains of racism, misogyny, and nativism; galloping income inequality; and Democratic Party failures that went unnoticed and uncorrected. All of these factors would help lay the groundwork for the successful candidacy of Donald J. Trump. He was slow indeed to reject the white supremacists and nationalists who rushed to endorse his presidential bid and he was brought to office in some measure by the very forces that the civil rights movement naively thought it had largely silenced. Because the lid had been kept on overt public racism and nativism for so long, many Americans were slow to understand how deeply systemic the problem is. The citizens of Selma voted for Hillary Clinton by a wide margin, but no matter. Trump’s wave has driven from power the vital center with which mass movements had once been able to partner. Vestiges of the very ethos against which the civil rights movement fought have grown ever stronger and found a welcome place in his White House, their strength buoyed by a growing societal disapproval of media elites. In the process, Trump has inoculated himself against appeals for justice as has no president in our lifetime. When it comes to any rights appeals in the immediate future, no one with real federal power is likely to be listening. There will be no sympathy for human rights petitioners from majority Republicans in the House of Representatives untroubled by reelection fears in their ferociously gerrymandered districts, nor from the soon-to-be-devastated civil rights division of the Department of Justice. What mechanisms will remain for the activists to activate? In a country becoming less white every day, Democrats recently stood helpless when it came to blocking the confirmation of the whitest cabinet in decades. Soon enough, the Supreme Court will have a conservative majority and then President Trump will have the run of the table, racking up a political monoculture unknown in our time. What many Americans think of as the civil rights movement — something in our black and white past, back there, back then — is, in fact, a deep running project launched long before we were born and sure to endure long after we are gone. In one now-historic decade, civil rights organizers brilliantly identified the levers of government power they could seize, but most of those levers are today out of reach. In response, will activism translate into concrete results the way it once did? Surely, a new generation of organizers now rising with a resolve and passion not seen in years, having broadened the civil rights project into a human rights one, will develop new strategies. Surely, they will discover or invent new means of stopping what threatens to be a contraction of democracy. Surely, with the power of social media — a veritable television station in the hands of every citizen — they will find their own ways of ensuring that oppression can’t dodge the spotlight. Already, the bottom-up strategy championed by SNCC has found new fluency in the ascendance of hyper-democratic Internet organizing and the raw eloquence of #BlackLivesMatter. Does reform still demand powerful allies, and if so, who might they be? A few centrist Republicans, courageous career attorneys in the Justice Department, billionaire Silicon Valley CEOs committed to pluralism, a mass of determined young people running for office? As organizers have discovered more than once since the early days of the republic, new levers lie waiting somewhere deep in the grand clockwork of our democracy. The only question is: Where? Jon ElseJon Else worked on the SNCC staff in 1964 and 1965. He was series producer and cinematographer for Eyes on the Prize, has produced and directed many award-winning documentaries, including The Day After Trinity and Cadillac Desert. A recipient of a MacArthur Fellowship, he is a professor at the University of California at Berkeley Graduate School of Journalism. His new book is True South: Henry Hampton and "Eyes on the Prize," the Landmark Television Series That Reframed the Civil Rights Movement.